Two hours before the doors were due to open a queue had already begun to form, and by the time the doors opened the queue was a fairly long one. This meant that The Dirty Youth, who took to the stage at the fairly early time of 7.30, managed to play to a venue that was already half full and still filling. Singer Danni Monroe is strikingly attractive with eye-catching pink hair and a great stage presence, and most importantly, she has a great voice. Headbanging regularly she moves around the stage making a great front woman. Having heard their debut album and really enjoying it, I was looking forward to seeing the band live, and they certainly didn't disappoint. They've got a good heavy sound live and also have enough of a resemblance to bands like Paramore to ensure they attract a wide fanbase. Throughout their set they got plenty of cheers and applause from the crowd. I'll be very surprised if The Dirty Youth arent playing at a festival next summer - they've got great songs, good musicians and a great front woman - this is a band that deserves to go a long way. After the changeover, Reckless love hit the stage at 8.30 (due to a club night after the gig, the curfew was set at 10pm rather than the usual 11pm). There were plenty of cheers as the band came out, but the loudest ones seemed to be reserved for singer Olli Herman. Kicking off with "Animal attraction", the title track of their new album they had the crowd under their spell right from the start. Olli Herman is a great frontman and his highly energetic performance which included some impressive high kicks as well as sprinting around the stage was exhausting to watch. The front row of the crowd was by this stage around 80% female, and they were clearly loving it, but the guys further back in the crowd in this pretty busy venue were obviously having just as much fun - Reckless love are a great live band and the atmosphere in the venue was definitely one big party. Olli strips off his T-shirt at regular intervals, sings bare chested for a while then goes offstage between songs to don a new T-shirt (although I think a significant number of ladies present would have preferred him to remain bare-chested. 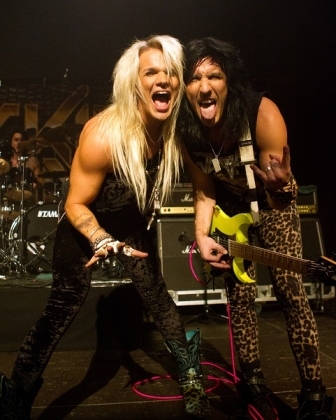 Reckless Love have a glam/hair metal image but have more of a punch than the image suggests. Whatever genre you want to call them is irrelevant - this is a great performance. The music is spot on with plenty of power, and they have the crowd under their spell - clapping or singing along on command. All the songs go down very well, but "Hot" in particular really gets the place going wild. Sadly transport problems meant I had to leave before the Encore, but this was an excellent night of music - two great bands together, both of whom should go a long way. I look forwards to seeing Reckless Love again at this year's Hard Rock Hell festival. I was there that night and having been a fan of Reckless Love for a while I was not disappointed! Their Energy was amazing and being a 80's rock child I loved the whole 80's influence mixed with their own awesome talent. I will defo be back in the Smoke from little old Halifax to see them again 2nd Feb! P.S. When I grow up I am going to Marry Olli Herman.